Death*: He died in December 1749. Note*: At his death he owned a 284-acre farm in Appoquinimink Hundred across the road from Union M.E. Church. Note*: From Ruth Bennett's "Naudain Family of Delaware," p. 39: "John was a well known character in Appoquinimink Hundred for many years. He was an honest, upright man, a bachelor and somewhat eccentric. He was about six feet in heighth [sic], well proportioned and had features not unlike those of George Washington. When dressed up, he wore a full dress coat, high buttoned Velvet vest and high silk hat, but was never known to wear an overcoat. He worked on farms during the spring, summer and autumn months and during the winter months visited among his relatives and friends. [James W. Lattomus, who compiled much of the information in Ms. Bennett's book] remembers him coming to his father's house, wearing his picturesque costume and bring his collection of photographs and his magnetised [sic] knife that would pick up a needle, and which never failed to secure [James's] childish interest. He lived to a good old age . . . . He was the last of the Fields family bearing the name which had been prominent in Appoquinimink Hundred for several generations." [S1] Ruth Bennett, Naudain Family of Delaware (Geneva, Neb. : n.pub., 1941), pp. 38-39. This material is a typescript of "notes" in Ms. Bennett's possession and apparently was originally written and compiled by James W. Lattomus. Copies are with the D.A.R. Library, Washington, D.C., and Roger Bartlett, Austin, Tex., and can be viewed at http://www.rabgenealogy.com/ui53.htm. The notes contain some inconsistencies, and page 45 was missing from the D.A.R. Library copy when it was copied. Marriage*: He married Diana Lattomus, daughter of _____ Lattomus. Marriage*: She married William Allfree, son of Mary _____. Birth*: She was born in Appoquinimink Hundred, New Castle County, Delaware. Marriage*: She married James Mannering on 13 January 1824. Marriage*: She married Joshua Townsend on 24 January 1833. Death*: She died on 9 January 1879. Note*: She was born near the Union Methodist Episcopal Church in Appoquinimink Hundred and lived in that area all her life. Both husbands were farmers. [S1] Ruth Bennett, Naudain Family of Delaware (Geneva, Neb. : n.pub., 1941), pp. 42, 68. This material is a typescript of "notes" in Ms. Bennett's possession and apparently was originally written and compiled by James W. Lattomus. Copies are with the D.A.R. Library, Washington, D.C., and Roger Bartlett, Austin, Tex., and can be viewed at http://www.rabgenealogy.com/ui53.htm. The notes contain some inconsistencies, and page 45 was missing from the D.A.R. Library copy when it was copied. Marriage*: He married Hester Naudain, daughter of Elias Naudain and Cassandra Fields, on 13 January 1824. Marriage*: He married Hester Naudain, daughter of Elias Naudain and Cassandra Fields, on 24 January 1833. Burial*: Interment was in Union Methodist Episcopal Church Cemetery, New Castle County, Delaware. Marriage*: She married John Naudain, son of Elias Naudain and Cassandra Fields, on 19 August 1834. [S1] Ruth Bennett, Naudain Family of Delaware (Geneva, Neb. : n.pub., 1941), p. 42. This material is a typescript of "notes" in Ms. Bennett's possession and apparently was originally written and compiled by James W. Lattomus. Copies are with the D.A.R. Library, Washington, D.C., and Roger Bartlett, Austin, Tex., and can be viewed at http://www.rabgenealogy.com/ui53.htm. The notes contain some inconsistencies, and page 45 was missing from the D.A.R. Library copy when it was copied. [S1] Ruth Bennett, Naudain Family of Delaware (Geneva, Neb. : n.pub., 1941), pp. 42, 69-70. This material is a typescript of "notes" in Ms. Bennett's possession and apparently was originally written and compiled by James W. Lattomus. Copies are with the D.A.R. Library, Washington, D.C., and Roger Bartlett, Austin, Tex., and can be viewed at http://www.rabgenealogy.com/ui53.htm. The notes contain some inconsistencies, and page 45 was missing from the D.A.R. Library copy when it was copied. [S961] Find A Grave, online at http://www.findagrave.com, memorial for Isabella Stringo Woolls Naudain, memorial no. 70256327, viewed on 28 Dec 2014 (not giving the date). [S1] Ruth Bennett, Naudain Family of Delaware, above, p. 42. [S1339] The Courier-Journal, Louisville, Ky., online at http://www.newspapers.com, 27 Dec 1911, p. 10, col. 4 (obituary of Mrs. Isabella Naudain) (giving the year but no other information). [S1] Ruth Bennett, Naudain Family of Delaware, above, p. 70. [S1] Ruth Bennett, Naudain Family of Delaware, above, pp. 69-70. [S1] Ruth Bennett, Naudain Family of Delaware, above, p. 69 (naming Elias McComb Naudain as her father). [S1] Ruth Bennett, Naudain Family of Delaware, above, pp. 69, 88 (naming Elias McComb Naudain as her father). [S1] Ruth Bennett, Naudain Family of Delaware, above, p. 69 (naming Elias McComb Naudain as his father). [S1] Ruth Bennett, Naudain Family of Delaware, above, pp. 69, 89 (naming Elias McComb Naudain as her father). Isabella Woolls Naudain's tombstone, Charlestown Cemetery, Charlestown, Ind., courtesy of Kevin Wright. Other Names*: Isabella Stringo Woolls Naudain, Isabella Woolls Naudain, Isabella Stringo Naudain, Isabella Naudain, Isabelle Stringo Woolls Naudain, Isabelle Woolls Naudain, Isabelle Stringo Naudain, Isabelle Naudain. Obituary*: "PASSENGER ON FIRST TRAIN. "Mrs. Isabella Naudain Dies in Ninety-fifth Year. "Mrs. Isabella Naudain, who was a passenger on the first regular train run on the Baltimore & Ohio railroad in 1836 and the grandmother of Charles M. Wilson, a guard at the Indiana reformatory, died at her home in Charlestown [Indiana] yesterday morning. Had Mrs. Naudain lived until next Tuesday she would have celebrated the ninety-fifth anniversary of her birth. Her death was the result of old age. "Her initial train ride was on the first road completed in the United States, extending from Washington to Baltimore. "As a girl Mrs. Naudain participated frequently in the functions at the White House, Washington. With Vice President Martin Van Buren she led a cotillion during a Washington birthday anniversary ball at the White House, while Andrew Jackson was President of the United States, February 23, 1835. Her mother was a relative of Martha Custis, who became the wife of Gen. Washington, and her father played the French horn in a band that furnished the music at the burial of Gen. Washington at Mt. Vernon in 1799. "Mrs. Naudain was born at Smyrna, Kent county, Del., January 1, 1817, and was a daughter of Mr. and Mrs. George Wools, who afterward became residents of Charlestown. In 1836 Miss Wools was married to Elias Naudain. Mr. and Mrs. Naudain located at Charlestown in 1838. Mr. Naudain died several years ago. Some time after the death of her husband, Mrs. Naudain went to Kentucky to live with her daughter, Mrs. George Logan, and while there was the victim of an accident, becoming crippled for life. Note*: • Her Find A Grave memorial says she was born on 2 Jan 1817, but a newspaper obituary says 1 Jan 1817. • In a 1909 article in a San Antonio, Texas newspaper, she is identified as Isabelle Woods Naudain. 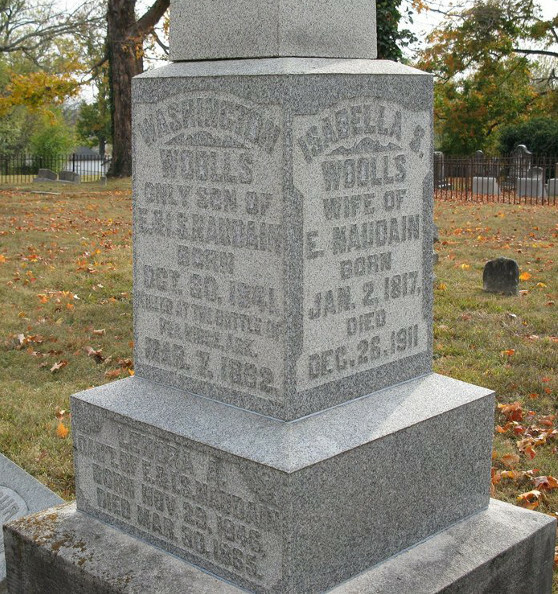 All other information indicates that her original name was Woolls, as stated in a family history and on her tombstone. • A 1909 newspaper article about her dancing with President Martin Van Buren is here. [S961] Find A Grave, online at http://www.findagrave.com, memorial for Isabella Stringo Woolls Naudain, memorial no. 70256327, viewed on 28 Dec 2014 (giving the date but not the place). [S1339] The Courier-Journal, Louisville, Ky., online at http://www.newspapers.com, 27 Dec 1911, p. 10, col. 4 (obituary of Mrs. Isabella Naudain) (but giving the date as 1 Jan 1817). [S961] Find A Grave, online, above, memorial for Isabella Stringo Woolls Naudain, memorial no. 70256327, viewed on 28 Dec 2014 (not giving the date). [S1339] The Courier-Journal, Louisville, Ky., above, 27 Dec 1911, p. 10, col. 4 (obituary of Mrs. Isabella Naudain) (giving the year but no other information). [S1556] The South Bend Tribune, South Bend, Ind., online at http://www.newspapers.com, 26 Dec 1911, p. 1, col. 5 (stating that she died "after being a helpless cripple for many years). [S961] Find A Grave, online, above, memorial for Isabella Stringo Woolls Naudain, memorial no. 70256327, viewed on 28 Dec 2014. [S1339] The Courier-Journal, Louisville, Ky., above, 27 Dec 1911, p. 10, col. 4. [S1339] The Courier-Journal, Louisville, Ky., above, 27 Dec 1911, p. 10, col. 4 (obituary of Mrs. Isabella Naudain) (giving the date as 1 Jan 1817) (first bullet). [S445] San Antonio Express, San Antonio, Tex., 18 Mar 1909, p. 13, col. 7 ("Belle at Van Buren's Ball"), available online at http://tinyurl.com/pepmth2 (giving the date as 2 Jan 1817) (first bullet). [S445] San Antonio Daily Express, San Antonio, Tex., 18 Mar 1909, p. 13, col. 7 ("Belle at Van Buren's Ball"), available online at http://tinyurl.com/pepmth2 (second bullet). [S1] Ruth Bennett, Naudain Family of Delaware, above, p. 69 (naming Isabella S. Woolls as her mother). [S961] Find A Grave, online, above, memorial for Isabella Stringo Woolls Naudain, memorial no. 70256327, viewed on 28 Dec 2014 (naming Isabella Stringo Woolls as his mother). [S1] Ruth Bennett, Naudain Family of Delaware, above, p. 69 (naming Isabella S. Woolls as his mother). [S961] Find A Grave, online, above, memorial for Isabella Stringo Woolls Naudain, memorial no. 70256327, viewed on 28 Dec 2014 (naming Isabella Stringo Woolls as her mother). [S630] Blanche Franklin, electronic mail to Roger Bartlett, 20 Jul 2001. [S1] Ruth Bennett, Naudain Family of Delaware, above, p. 42 (not giving the date). [S630] Blanche Franklin, electronic mail to Roger Bartlett, 20 Jul 2001, (naming Cassandra Naudain as his mother). [S630] Blanche Franklin, electronic mail to Roger Bartlett, 20 Jul 2001, (naming Cassandra Naudain as her mother). [S1] Ruth Bennett, Naudain Family of Delaware (Geneva, Neb. : n.pub., 1941), p. 42 (not giving the date or place). This material is a typescript of "notes" in Ms. Bennett's possession and apparently was originally written and compiled by James W. Lattomus. Copies are with the D.A.R. Library, Washington, D.C., and Roger Bartlett, Austin, Tex., and can be viewed at http://www.rabgenealogy.com/ui53.htm. The notes contain some inconsistencies, and page 45 was missing from the D.A.R. Library copy when it was copied. [S630] Blanche Franklin, electronic mail to Roger Bartlett, 20 Jul 2001, (naming Rebecca Ann Naudain as his mother). [S630] Blanche Franklin, electronic mail to Roger Bartlett, 20 Jul 2001, (naming Rebecca Ann Naudain as her mother). [S630] Blanche Franklin, electronic mail to Roger Bartlett, 20 Jul 2001, (naming Rebecca Ann Naudain as perhaps being her mother). [S1] Ruth Bennett, Naudain Family of Delaware, above, p. 42 (not giving the date or place). [S199] Supposition as to father's identity, (based on mother's marriage). [S630] Blanche Franklin, electronic mail to Roger Bartlett, 20 Jul 2001, (naming Isaac Short as his father). [S630] Blanche Franklin, electronic mail to Roger Bartlett, 20 Jul 2001, (naming Isaac Short as her father). [S630] Blanche Franklin, electronic mail to Roger Bartlett, 20 Jul 2001, (naming Isaac Short as perhaps being her father). [S1] Ruth Bennett, Naudain Family of Delaware (Geneva, Neb. : n.pub., 1941), p. 43. This material is a typescript of "notes" in Ms. Bennett's possession and apparently was originally written and compiled by James W. Lattomus. Copies are with the D.A.R. Library, Washington, D.C., and Roger Bartlett, Austin, Tex., and can be viewed at http://www.rabgenealogy.com/ui53.htm. The notes contain some inconsistencies, and page 45 was missing from the D.A.R. Library copy when it was copied. Marriage*: She married Allen Fields, son of Abraham Fields. Marriage*: He married Sarah Ann Brooks, daughter of Christopher Brooks and _____ _____, on 5 June 1832. Note*: He lived on a farm near Newport, Delaware from 1849 to 1853, on a farm near Odessa, Deaware from 1853 to 1855, and in Newark, Delaware from 1855 until his death. He and his father were on the first board of trustees of Salem Methodist Episcopal Church. He was a Whig and served in the 1849 session of the Delaware House of Representatives. [S1] Ruth Bennett, Naudain Family of Delaware (Geneva, Neb. : n.pub., 1941), pp. 43, 70. This material is a typescript of "notes" in Ms. Bennett's possession and apparently was originally written and compiled by James W. Lattomus. Copies are with the D.A.R. Library, Washington, D.C., and Roger Bartlett, Austin, Tex., and can be viewed at http://www.rabgenealogy.com/ui53.htm. The notes contain some inconsistencies, and page 45 was missing from the D.A.R. Library copy when it was copied. [S720] Dorothy Colburn, comp., Old Drawyers: The First Presbyterian Church in St. George's Hundred (Odessa, Del. : n.pub., 1989), pp. 201, 299 (giving only the year and not naming the place), 326 (giving only the year and not naming the place). [S961] Find A Grave, online at http://www.findagrave.com, memorial for viewed on 3 Apr 2010 (Elias Naudain, memorial no. 14449284) (giving the date but not the place). [S720] Dorothy Colburn, comp., Old Drawyers: The First Presbyterian Church in St. George's Hundred, above, pp. 299, 326. [S961] Find A Grave, online, above, memorial for viewed on 3 Apr 2010 (Elias Naudain, memorial no. 14449284). [S1337] The Evening Journal, Wilmington, Del., online at http://www.newspapers.com, 4 Feb 1911, p. 10, col. 3 (obituary of Arnold S. Naudain) (naming Elias S. Naudain as his father). [S1441] Wilmington Morning News, Wilmington, Del., online at http://www.newspapers.com, 31 Jul 1933, p. 2, col. 1 (death notice for Alexena Naudain) (naming Elias S. Naudain as her father). [S961] Find A Grave, online, above, memorial for Alexena Naudain, memorial no. 66374173, viewed on 30 Jun 2018 (naming Elias S. Naudain as her father). [S961] Find A Grave, online, above, memorial for Estelle Naudain, memorial no. 66374177, viewed on 5 Jul 2016 (naming Elias S. Naudain as her father). [S961] Find A Grave, online, above, memorial for Joseph Coudon Naudain, memorial no. 5086681, viewed on 3 Apr 2010 (naming Elias S. Naudain as his father). Marriage*: She married Elias Skeer Naudain, son of Rev. Arnold Skeer Naudain and Jemima Van Horn, on 5 June 1832. Other Names*: Saran Ann Brooks Naudain, Sarah Brooks Naudain, Sarah Ann Naudain. [S720] Dorothy Colburn, comp., Old Drawyers: The First Presbyterian Church in St. George's Hundred (Odessa, Del. : n.pub., 1989), pp. 201, 300, 326 (giving the year but not the date). [S961] Find A Grave, online at http://www.findagrave.com, memorial for viewed on 3 Apr 2010 (Sarah Ann Brooks Naudain, memorial no. 14448906). [S720] Dorothy Colburn, comp., Old Drawyers: The First Presbyterian Church in St. George's Hundred, above, pp. 300, 326. [S1337] The Evening Journal, Wilmington, Del., online at http://www.newspapers.com, 4 Feb 1911, p. 10, col. 3 (obituary of Arnold S. Naudain) (naming Sarah A. Naudain as his mother). [S1441] Wilmington Morning News, Wilmington, Del., online at http://www.newspapers.com, 31 Jul 1933, p. 2, col. 1 (death notice for Alexena Naudain) (naming Sara Brooks Naudain as her mother). [S961] Find A Grave, online, above, memorial for Alexena Naudain, memorial no. 66374173, viewed on 30 Jun 2018 (naming Sarah Ann Brooks Naudain as her mother). [S961] Find A Grave, online, above, memorial for Estelle Naudain, memorial no. 66374177, viewed on 5 Jul 2016 (naming Sarah A. Naudain as her mother). [S961] Find A Grave, online, above, memorial for Joseph Coudon Naudain, memorial no. 5086681, viewed on 3 Apr 2010 (naming Sarah A. Naudain as his mother). Birth*: He was born on 16 December 1807 in Appoquinimink Hundred, New Castle County, Delaware. Marriage*: He married Mary Ann Horn circa 1838. Marriage*: He married Elizabeth M. Price on 10 July 1856. Death*: He died on 20 October 1867 at age 59. Burial*: Interment was in Saint Anne's Church Cemetery, New Castle County, Delaware. Note*: He was a merchant in Blackbird, Delaware until moving to Odessa, Delaware, where he continued in the mercantile business. He got into the business of buying and shipping grain but ran into financial difficulties that resulted in his property's being sold at a sheriff's sale on 12 Nov 1862 despite help from brothers Elias and John. He was buried in the family graveyard at the family home near St. Anne's Church, but several years after his death all remains there were relocated to the St. Anne's Cemetery. [S1] Ruth Bennett, Naudain Family of Delaware (Geneva, Neb. : n.pub., 1941), pp. 43, 71. This material is a typescript of "notes" in Ms. Bennett's possession and apparently was originally written and compiled by James W. Lattomus. Copies are with the D.A.R. Library, Washington, D.C., and Roger Bartlett, Austin, Tex., and can be viewed at http://www.rabgenealogy.com/ui53.htm. The notes contain some inconsistencies, and page 45 was missing from the D.A.R. Library copy when it was copied. [S1] Ruth Bennett, Naudain Family of Delaware, above, pp. 72, 90 (both naming Jacob Van Horn Naudain as her father). Birth*: She was born circa 1819. Marriage*: She married Jacob Van Horn Naudain, son of Rev. Arnold Skeer Naudain and Jemima Van Horn, circa 1838. Death*: She died on 8 January 1848. Marriage*: She married Jacob Van Horn Naudain, son of Rev. Arnold Skeer Naudain and Jemima Van Horn, on 10 July 1856. Note*: She survived her husband. Birth*: She was born on 23 December 1811. [S1] Ruth Bennett, Naudain Family of Delaware (Geneva, Neb. : n.pub., 1941), p. 72 (not giving the date). This material is a typescript of "notes" in Ms. Bennett's possession and apparently was originally written and compiled by James W. Lattomus. Copies are with the D.A.R. Library, Washington, D.C., and Roger Bartlett, Austin, Tex., and can be viewed at http://www.rabgenealogy.com/ui53.htm. The notes contain some inconsistencies, and page 45 was missing from the D.A.R. Library copy when it was copied. Note*: He was educated at Middletown Academy and was a farmer. He inherited considerable land from his father, bought more, and owned about 3500 acres of "the choicest land on the Peninsula," in Delaware and Cecil County, Maryland, at his death. [S1] Ruth Bennett, Naudain Family of Delaware (Geneva, Neb. : n.pub., 1941), pp. 44, 90. This material is a typescript of "notes" in Ms. Bennett's possession and apparently was originally written and compiled by James W. Lattomus. Copies are with the D.A.R. Library, Washington, D.C., and Roger Bartlett, Austin, Tex., and can be viewed at http://www.rabgenealogy.com/ui53.htm. The notes contain some inconsistencies, and page 45 was missing from the D.A.R. Library copy when it was copied. [S1] Ruth Bennett, Naudain Family of Delaware, above, p. 72 (not giving the date). [S1] Ruth Bennett, Naudain Family of Delaware, above, pp. 72 (giving the full date), 90 (giving only the year). [S1] Ruth Bennett, Naudain Family of Delaware, above, pp. 71-72 (naming William Wilson as his father). [S1] Ruth Bennett, Naudain Family of Delaware, above, p. 90 (naming William Wilson as her father). [S1343] Journal-Every Evening, Wilmington, Del., online at http://www.newspapers.com, 1 Nov 1943, p. 10, col. 4 (obituary for Mrs. Rachel Watkins) (naming William Wilson as her father). [S1] Ruth Bennett, Naudain Family of Delaware, above, p. 90 (naming William Wilson as his father). [S1337] The Evening Journal, Wilmington, Del., online at http://www.newspapers.com, 23 Jul 1923, p. 1, col. 1 (obituary of Edward V. Wilson) (naming William Wilson as his father). [S1340] The Morning News, Wilmington, Del., online at http://www.newspapers.com, 6 Mar 1928, p. 2, col. 3 (obituary for Howard G. Wilson) (naming William Wilson as his father). Birth*: She was born in 1813. Marriage*: She married Alexander Darrah Short, son of James Short and Lydia Barrington Darrah, in 1832. Marriage*: She married Benjamin Merritt Crawford in 1844. Death*: She died on 18 December 1872. [S1] Ruth Bennett, Naudain Family of Delaware (Geneva, Neb. : n.pub., 1941), p. 44. This material is a typescript of "notes" in Ms. Bennett's possession and apparently was originally written and compiled by James W. Lattomus. Copies are with the D.A.R. Library, Washington, D.C., and Roger Bartlett, Austin, Tex., and can be viewed at http://www.rabgenealogy.com/ui53.htm. The notes contain some inconsistencies, and page 45 was missing from the D.A.R. Library copy when it was copied. Birth*: He was born in 1810 in Sussex County, Delaware. Marriage*: He married Ann Jemima Naudain, daughter of Rev. Arnold Skeer Naudain and Jemima Van Horn, in 1832. Death*: He died in 1834. [S1] Ruth Bennett, Naudain Family of Delaware (Geneva, Neb. : n.pub., 1941), pp. 44, 72-73. This material is a typescript of "notes" in Ms. Bennett's possession and apparently was originally written and compiled by James W. Lattomus. Copies are with the D.A.R. Library, Washington, D.C., and Roger Bartlett, Austin, Tex., and can be viewed at http://www.rabgenealogy.com/ui53.htm. The notes contain some inconsistencies, and page 45 was missing from the D.A.R. Library copy when it was copied. Marriage*: He married Ann Jemima Naudain, daughter of Rev. Arnold Skeer Naudain and Jemima Van Horn, in 1844. Note*: He was born near Middletown, Delaware. They lived near Middletown for a while and then moved to Cecil County, Maryland, where he farmed. [S1] Ruth Bennett, Naudain Family of Delaware, above, p. 72 (naming Benjamin Merritt Crawford as his father). Birth*: She was born on 3 January 1816. Death*: She died in 1833. Marriage*: He married Mary L. Lockwood, daughter of Richard Lockwood and Mary R. Wilson. Birth*: He was born on 11 October 1817 in New Castle County, Delaware. Death*: He died on 14 March 1864 at age 46. Note*: He was born on his father's farm between Middletown and Blackbird, Delaware. He took up farming after schooling at home under private tutors and at Pennington Seminary, Pennington, New Jersey, and operated the family farm after his father's retirement. After their father's death, he bought the interests of his sisters, Ann and Mary, in the farm. He had orchards containing about 6,000 peach trees. A Whig, he was elected to the Delaware Legislature in 1858. According to Ruth Naudain's "Naudain Family of Delaware," he was "active and influential in the community" and "was widely known and esteemed for his good judgment and integrity." [S1] Ruth Bennett, Naudain Family of Delaware (Geneva, Neb. : n.pub., 1941), pp. 44, 73-74. This material is a typescript of "notes" in Ms. Bennett's possession and apparently was originally written and compiled by James W. Lattomus. Copies are with the D.A.R. Library, Washington, D.C., and Roger Bartlett, Austin, Tex., and can be viewed at http://www.rabgenealogy.com/ui53.htm. The notes contain some inconsistencies, and page 45 was missing from the D.A.R. Library copy when it was copied. Marriage*: She married John Mansfield Naudain, son of Rev. Arnold Skeer Naudain and Jemima Van Horn. Note*: She was from Appoquinimink Hundred, New Castle County, Delaware. [S1] Ruth Bennett, Naudain Family of Delaware (Geneva, Neb. : n.pub., 1941), pp. 43-44 (naming Arnold Skeer Naudain as her father). This material is a typescript of "notes" in Ms. Bennett's possession and apparently was originally written and compiled by James W. Lattomus. Copies are with the D.A.R. Library, Washington, D.C., and Roger Bartlett, Austin, Tex., and can be viewed at http://www.rabgenealogy.com/ui53.htm. The notes contain some inconsistencies, and page 45 was missing from the D.A.R. Library copy when it was copied. [S1] Ruth Bennett, Naudain Family of Delaware, above, p. 44. [S1365] The Sun, Baltimore, Md., online at http://www.newspapers.com, 21 Jan 1884, p. 4, col. 6. Birth*: He was born on 12 April 1821. Death*: He died on 15 August 1840 at age 19. Birth*: He was born on 10 February 1825. Death*: He died on 23 August 1853 at age 28. Birth*: She was born on 24 July 1827 in Appoquinimink Hundred, New Castle County, Delaware. Marriage*: She married Rev. Samuel D. Norwood circa 1848. Marriage*: She married John McCrone Jr. on 21 February 1850. Death*: She died on 8 April 1882 at age 54. Note*: Her first husband died about a year after they married. Her second husband's death left her with eight young children. [S1] Ruth Bennett, Naudain Family of Delaware (Geneva, Neb. : n.pub., 1941), pp. 44, 74. This material is a typescript of "notes" in Ms. Bennett's possession and apparently was originally written and compiled by James W. Lattomus. Copies are with the D.A.R. Library, Washington, D.C., and Roger Bartlett, Austin, Tex., and can be viewed at http://www.rabgenealogy.com/ui53.htm. The notes contain some inconsistencies, and page 45 was missing from the D.A.R. Library copy when it was copied. [S1365] The Sun, Baltimore, Md., online at http://www.newspapers.com, 23 Feb 1916, p. 5, col. 6 (obituary of Mrs. J. Louise Nickols) (naming Elizabeth Naudain McCrone as her mother). Marriage*: He married Mary Elizabeth Naudain, daughter of Rev. Arnold Skeer Naudain and Jemima Van Horn, circa 1848. Death*: He died circa 1849. Birth*: He was born on 10 January 1821 in New Castle County, Delaware. Marriage*: He married Mary Elizabeth Naudain, daughter of Rev. Arnold Skeer Naudain and Jemima Van Horn, on 21 February 1850. Death*: He died on 24 October 1866 in Cecil County, Maryland (near Warwick), at age 45. Note*: He was a farmer near Warwich, Maryland. Birth*: She was born on 1 August 1831. Death*: She died on 24 July 1848 at age 16. [S1] Ruth Bennett, Naudain Family of Delaware (Geneva, Neb. : n.pub., 1941), pp. 47-48. This material is a typescript of "notes" in Ms. Bennett's possession and apparently was originally written and compiled by James W. Lattomus. Copies are with the D.A.R. Library, Washington, D.C., and Roger Bartlett, Austin, Tex., and can be viewed at http://www.rabgenealogy.com/ui53.htm. The notes contain some inconsistencies, and page 45 was missing from the D.A.R. Library copy when it was copied. [S1] Ruth Bennett, Naudain Family of Delaware (Geneva, Neb. : n.pub., 1941), p. 47. This material is a typescript of "notes" in Ms. Bennett's possession and apparently was originally written and compiled by James W. Lattomus. Copies are with the D.A.R. Library, Washington, D.C., and Roger Bartlett, Austin, Tex., and can be viewed at http://www.rabgenealogy.com/ui53.htm. The notes contain some inconsistencies, and page 45 was missing from the D.A.R. Library copy when it was copied. Birth*: He was born in 1809. Death*: He died circa 1865. Note*: He studied medicine and during the Civil War was a physician in a New Orleans hospital. He is believed to have died soon after the war ended. [S1] Ruth Bennett, Naudain Family of Delaware (Geneva, Neb. : n.pub., 1941), p. 48. This material is a typescript of "notes" in Ms. Bennett's possession and apparently was originally written and compiled by James W. Lattomus. Copies are with the D.A.R. Library, Washington, D.C., and Roger Bartlett, Austin, Tex., and can be viewed at http://www.rabgenealogy.com/ui53.htm. The notes contain some inconsistencies, and page 45 was missing from the D.A.R. Library copy when it was copied. Birth*: She was born on 4 October 1811. Death*: She died on 18 April 1882 at age 70. Obituary*: "Death and Burial of an Aged Man. [S1] Ruth Bennett, Naudain Family of Delaware (Geneva, Neb. : n.pub., 1941), pp. 48, 75. This material is a typescript of "notes" in Ms. Bennett's possession and apparently was originally written and compiled by James W. Lattomus. Copies are with the D.A.R. Library, Washington, D.C., and Roger Bartlett, Austin, Tex., and can be viewed at http://www.rabgenealogy.com/ui53.htm. The notes contain some inconsistencies, and page 45 was missing from the D.A.R. Library copy when it was copied. [S961] Find A Grave, online at http://www.findagrave.com, memorial for Arnold Naudain, memorial no. 9096360, viewed on 6 Aug 2016. [S700] Articles from The Cecil Whig, Elkton, Md., online ftp://ftp.rootsweb.com/pub/usgenweb/md/cecil/newspapers/whig1884b.txt, (attributing information to her death notice in The Cecil Whig, Elkton, Md., 23 Aug 1884, stating that she was the wife of Arnold Naudain, Sr. but not giving the marriage date). [S961] Find A Grave, online, above, memorial for viewed on 3 Apr 2010 (Esther Yarnal Torbert Naudain, memorial no. 9096418) (not giving the date). [S1340] The Morning News, Wilmington, Del., online at http://www.newspapers.com, 30 Jun 1898, p. 3, col. 3 (obituary of Arnold Naudain, Sr.). [S961] Find A Grave, online, above, memorial for Arnold Naudain, memorial no. 9096360, viewed on 6 Aug 2016 (giving the date but not the place). [S961] Find A Grave, online, above, memorial for Arnold Naudain, memorial no. 9096360, viewed on 6 Aug 2016 (not giving the date). [S1340] The Morning News, Wilmington, Del., above, 30 Jun 1898, p. 3, col. 3. [S961] Find A Grave, online, above, memorial for viewed on 3 Apr 2010 (Ellen T. Naudain, memorial no. 9096386) (naming Arnold Naudain as her father). [S1] Ruth Bennett, Naudain Family of Delaware, above, p. 75 (naming Arnold Naudain as her father). [S961] Find A Grave, online, above, memorial for Annie M. Naudain, memorial no. 9096358, viewed on 3 Apr 2010 (naming Arnold Naudain as her father). [S961] Find A Grave, online, above, memorial for viewed on 3 Apr 2010 (Mary Naudain Klair, memorial no. 9094010) (naming Arnold Naudain as her father). [S961] Find A Grave, online, above, memorial for viewed on 3 Apr 2010 (Arnold Naudain, Jr., memorial no. 9096365) (naming Arnold Naudain as his father). [S961] Find A Grave, online, above, memorial for viewed on 3 Apr 2010 (Elizabeth T. Naudain, memorial no. 9096377) (naming Arnold Naudain as her father). [S961] Find A Grave, online at http://www.findagrave.com, memorial for viewed on 3 Apr 2010 (Esther Yarnal Torbert Naudain, memorial no. 9096418). [S700] Articles from The Cecil Whig, Elkton, Md., online ftp://ftp.rootsweb.com/pub/usgenweb/md/cecil/newspapers/whig1884b.txt, (attributing information to The Cecil Whig, Elkton, Md., 23 Aug 1884). [S961] Find A Grave, online, above, memorial for (Esther Yarnal Torbert Naudain, memorial no. 9096418) (giving the year but not the date). [S961] Find A Grave, online, above, memorial for (Esther Yarnal Torbert Naudain, memorial no. 9096418) (not giving the date). Birth*: She was born in May 1816. Death*: She died in December 1904 at age 88. Marriage*: He married Susan Torbert in October 1849. Obituary*: "Death of Matthew M. Naudain. [S1074] 1880 U.S. Census, Cecil County, Md., schedule 1, 3rd election dist., p. 11, dwelling 72, family 72 (indicating that he was born in Delaware in 1820 or 1821). [S697] Obituary/Death Notice Index for Cecil County, Maryland, online ftp://ftp.rootsweb.com/pub/usgenweb/md/cecil/obits/obitindx.txt, (giving only the date). [S701] Articles from The Cecil Whig, Elkton, Md., online ftp://ftp.rootsweb.com/pub/usgenweb/md/cecil/newspapers/whig1884.txt, (attributing information to The Cecil Whig, Elkton, Md., 24 May 1884). [S1507] The Cecil Whig, Cecil, Md., online at https://www.newspaperarchive.com, 24 May 1884, p. 3, col. 4. [S1] Ruth Bennett, Naudain Family of Delaware, above, pp. 75, 93 (naming Matthew M. Naudain as his father).